Question 1. What is the greatest number that will divide 2930 and 3250 and will leave as remainders 7 and 11 respectively? Solution: The greatest number will be the HCF of (2930 – 7) and (3250 – 11), i.e. 79. Question 2. What is the least number by which 825 must be multiplied in order to produce a multiple of 715? Any multiple of 715 must have factors of 5, 11 and 13. So, 825 should be multiplied by the factor(s) of 715, which is (are) not present in 825. Question 3. 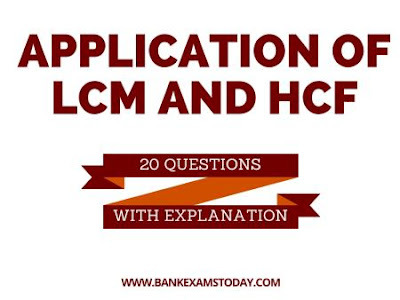 The LCM of two numbers is 2310 and their HCF is 30. If one of the numbers is 7 × 30, find the other number. Solution: the required number = (2310 ×30)/(7 ×30) = 330. Question 4. Three bells commence tolling together and they toll after 0.25, 0.1 and 0.125 seconds. After what interval will they again toll together? Solution: They will toll together after an interval of time equal to the LCM of 0.25 sec, 0.1 sec and 0.125 sec. = 500 × 0.001 = 0.5 sec. Question 5. What is the smallest sum of money which contains Rs. 2.50, Rs. 20, Rs. 1.20 and Rs. 7.50? Here the highest number of decimal is 1 so we multiply each by 10 to get 25, 200, 12 and 75. Question 6. What is the greatest number which will divide 410, 751 and 1030 so as to leave the remainder 7 in each case? Solution: the required number will be the HCF of (410-7), (751 – 7), (1030 – 7) i.e. 31. Question 7. What is the HCF of 4/5 , 5/6 and 7/15 ? Question 8. Three men start together to travel the same way around a circular track of 11 km. Their speeds are 4, 5.5 and 8 km per hour respectively. When will they meet at the starting point? Question 10. Find the least square number which is exactly divisible by 4, 5, 6, 15 and 18.Solution: LCM of 4, 5, 6, 15 and 18 = 180, which is exactly divisible by the given numbers. You can see that 2 and 3 are paired but 5 is not . To make it paired we need to multiply by 5 so that the whole multiplication becomes a perfect square. Therefore, if 180 is multiplied by 5 (180 × 5 = 900) and 900 will be a perfect square as well as divisible by 4, 5, 6, 15 and 18. Question 11. Find the sum of a numbers between 300 and 400 such that when they are divided by 6, 9 and 12. (ii) it leaves remainder as 4 in each case. ∴ The required sum = 328 + 364 = 692.